Moisture Testing in Concrete: A Critical Step – Plexi-Chemie, Inc. When too much moisture exists in a concrete substrate, the result can be disastrous for the application of a floor coating system. Too much moisture creates a substrate condition that is not conducive to the proper adhesion of a coating system, leading to delamination and an eventual coating system failure. In these situations, the application of a moisture mitigation system is needed. However, it first must be determined if a moisture mitigation coating is required. Currently, there are two industry accepted moisture tests that can be conducted prior to the application of floor coatings – the calcium chloride test and the relative humidity (RH) test. Read on for more information about these two test methods and why manufacturers and architects strongly recommend that coatings contractors perform one or both prior the installation process. It is always recommended to test the moisture content of the slab prior to installation the resinous flooring system. Historically, the most common test to measure the moisture vapor emission rate (MVER) is the calcium chloride test (ASTM F1869). This test is usually administered every 1,000 square feet and consists of sealing a small dish of calcium chloride under a plastic dome on a clean section of concrete. (If there is an existing coating on the concrete substrate, it must be removed. The floor must then be scraped and grinded to ensure a clean surface). The salt absorbs the moisture under the dome over the course of 72 hours. At that time, the weight gain is calculated and used to determine the moisture vapor emission rate. 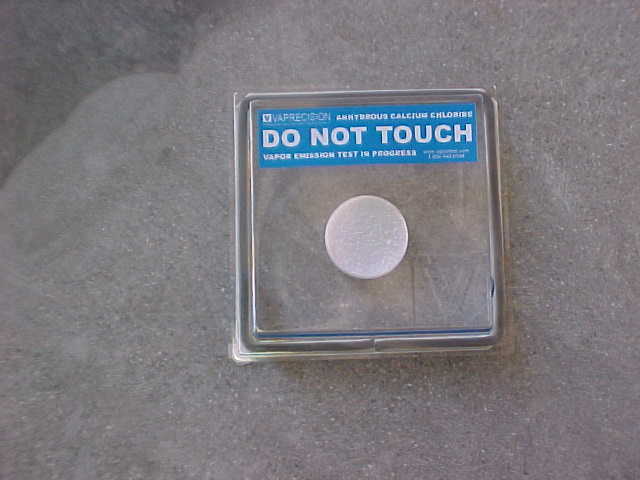 While the calcium chloride test is cost effective at the outset – the kits are relatively inexpensive – this method only reveals the moisture at the surface of the concrete. Unfortunately, the fact that the test shows only what’s going on at the top ¾-inch of the slab means that the test is sensitive to ambient relative humidity and temperature and does not reveal any information about moisture deep in the slab. Over the last decade or so, the relative humidity method has become more and more popular. In this test, in situ probes are inserted into holes drilled into the substrate (ASTM F2170). RH sensors are placed within the slab at a specific depth scientifically proven to be an indicator of the final moisture condition of the slab once the surface is sealed – 40% of the slab depth for a slab drying from one side, or 20% for a slab drying from two sides. While the relative humidity probe test is a bit more involved and costly than the calcium chloride test, it provides more accurate measurements of moisture in concrete slabs over time. It is less likely to be affected by ambient conditions. Most significant, relative humidity tests provide information about moisture levels deep in the concrete slab, rather than just on the surface. Another advantage to the relative humidity method is that results can be read within 24 hours. Conducting a moisture test of either method prior to coating application is vital to proper adhesion, especially in areas like Florida where the water table is high. In fact, most architects and manufacturers list moisture testing in their specifications. As far as which test is best, the industry seems to be leaning toward recommending relative humidity testing as the preferred method. RH test results tend to give a more accurate picture of the true moisture condition of a concrete slab and are a more reliable predictor of whether or not a floor coating on a concrete slab will succeed or fail. However, before making any decisions about which test method to use, it is important to review the coating manufacturer’s installation instructions and warranty information to see if a particular method is required or recommended. For more information about moisture testing and Plexi-Chemie products, please call 904-693-8800.